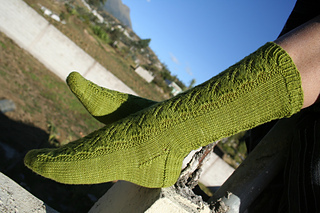 These lace socks feature a lovely lace panel in stockinette, a traditional turned heel, and shaped toe. 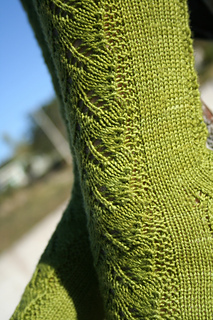 This pattern is written for one long circular needle (Magic Loop) or two circulars. 36 sts and 45 rounds = 4” 10 cm in St st on US 1 when worked in the rnd. 32 sts and 44 rounds = 4” 10cm in St st on US 2 when worked in the rnd.